A special copper wire with pure sterling silver-plating is wound on a high strength nylon silk under constant tension. Perfect sound in any position, A good vibration is being achieved by using a special technique and due to the higher mass of sterling silver. These are good strings, so I hate to give them four stars, but these are not what I prefer. Good things: project well. Bell-like tones from the trebles. Basses are clean-sounding and feel silky-smooth. Ok projection. They seem to hold the tune quickly right after putting them on. Not-so-good: The fluorocarbon trebles are harder tension than you'd expect. The G is good--my instructor often puts a fluorocarbon G string on to avoid the thick, plastic sound of a nylon G. But the B and E are too hard for my preference, it's not easy to get vibrato out of them and even the contrast of sound between ponticello and sul tasto does not seem as great with these. The trebles are thinner and feel hard under the fingertips. This isn't a big problem but there is a difference. The bell-like tone is pleasant, but I miss variety of sounds I can get more easily with nylon and I don't like the hard, thin feel of the trebles. I'd buy the bass strings and a single G but never again a full set. The bass strings sound really nice on my guitar. 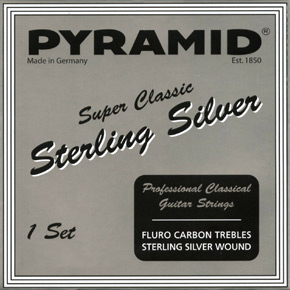 I can't say about the treble strings because I don't like carbon or titanium strings on the top.